Prism Jewelry. Jewelry created for dreaming. Unique interactions of the gold smith’s art combining movement with geometry, simplicity with elegance, symbology of many civilizations and glamour with purity. The warm hues of yellow, pink & white gold, the bright colors of precious stones and the regal brilliance of diamonds create collections of rings, earrings, pendants, necklaces and bracelets for a very Prism type of luxury. I couldn't wait for this pendant, however when I opened the box I was so disappointed. The diamonds appeared to be dull, but my main problem was the hookup. 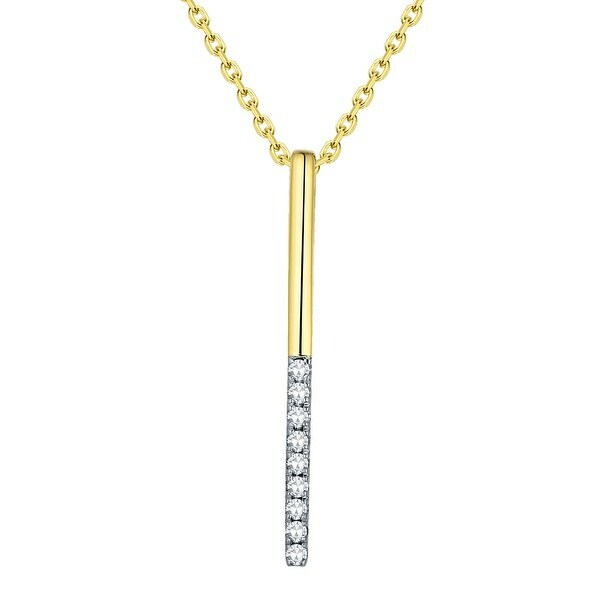 I put it on different gold necklaces, but the bar turned sideways every time, since the hook was not flat, but oval, and you couldn't see the diamonds. I had to send it back. Finally received my beautiful pendant!! Well worth the wait!! It is just beautiful and had lots of sparkle. Got it at a great price as well! I have it on an adjustable chain so I can it more as a lariat look or higher for choker look!! Love it!! My 13 yr granddaughter is into jewelry so I’ll see how she does with this pendant . "what is the size of the bar and the length of the chain?"